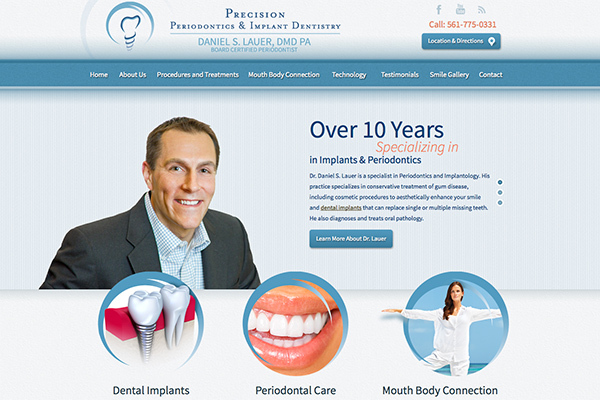 Dr. Daniel Lauer of Precision Periodontics & Implant Dentistry recently partnered with Rosemont Media for the development of his new website. The improved design communicates his periodontal and dental implantology expertise in a responsive, easy-to-navigate format. As patients visit the site, they will find an easily navigable display of procedures and other important oral health information through drop-down menus. Website visitors can also read through a comprehensive collection of past patient cases with before-and-after pictures as well as testimonial videos and letters. All content on the Palm Beach periodontics website is unique to Dr. Lauer’s practice, designed to fit any screen, and optimized for higher rankings in all major search engine. The new website is designed to create a thorough and easy-to-use resource for potential patients to learn about Dr. Lauer’s practice and the services he offers. Beyond its attractive appearance, Rosemont Media customized the dental website design to reflect Dr. Lauer’s extensive knowledge on periodontics and favorable reputation within the industry. For a look into Rosemont Media’s dental website design portfolio and what the agency can do for your practice, visit precisionperio.com.